Best time to let a blog post hit? So what’s the best time to have a blog post hit do you think? I’m going to try this one on a Monday, mid-morning and see what happens. Just food for thought really. If I get some ridiculous traffic spike I guess it worked. I tend to like to shoot at the beach. I spent a lot of time at the beach as a kid and it has a special connection to me, and now to my daughters. I don’t think I could ever live more than an hour’s drive form the ocean. You’ll see a lot of ocean my photos as time goes on. In this case I went to Salisbury Beach in Salisbury Massachusetts, looking for some oceanside landscapes. I came across a couple of guys kitesurfing. It was cool to watch and they didn’t mind if I shot while they were out there. I’ve got a handful of images that I like from this outing. This one is a favorite. I used daylight white balance for the sky and cloudy for the kite in lightroom. 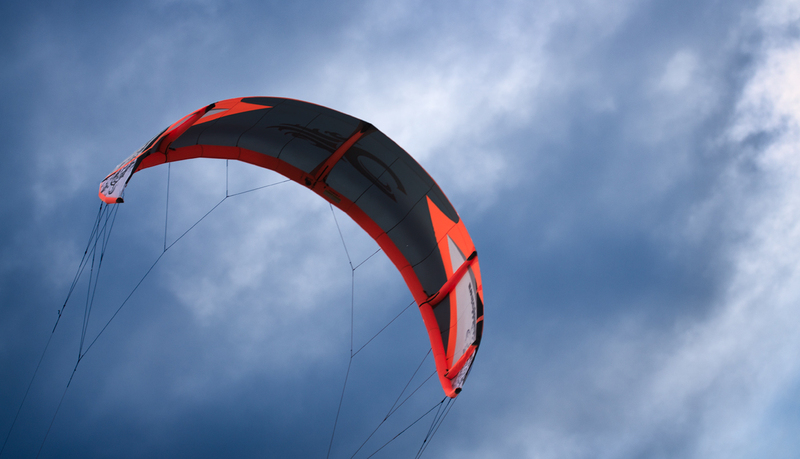 I did this to help accentuate the color contrast of the warm kite and the cool sky. I then took them into Photoshop and masked them together. A couple of curves later and I was good to go. I’m trying to be more subtle in my post processing recently. So I figure soon I’ll post a psychedelic High-contrast HDR and keep everyone on their toes. As always click here for supersize.